As I’ve been working on the shelf, bike rack and lumber box this week, I’ve been practicing with the Wacom some more. This thing is going to take a long time to get used to. I can see where it would already be valuable for coloring sketches or doing really loose stuff like The Last Stronghold. For precise drawing, it takes a lot of effort. I tried doing The Thing a couple of weeks ago and eventually just did it by hand. This week I was determined that I would get something decent done 100% on the tablet. 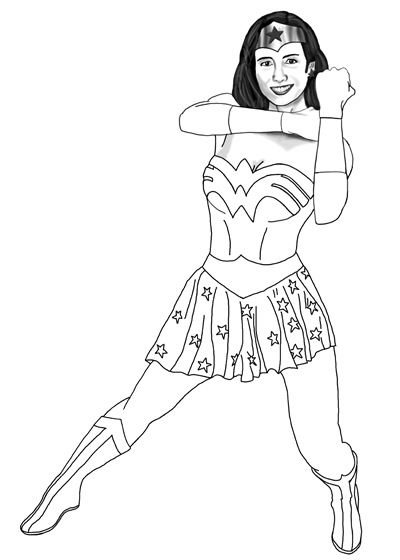 I present to you my version of Wonder Woman. I’ll be following this tutorial for digital coloring in one of the coming weeks. I’m looking forward to that part. I think it will be much more fun and easy than the line art. Of course, Wonder Woman is owned and protected by DC Comics. I am not claiming the character is my creation. She looks very friendly. A little like Minnie Driver. Yeah. I liked friendly and modest (skirt not tights). I hadn’t thought about Minnie Driver but she does. Similar build and face. I also think that he nailed Superman, but of course I’m from the generation for which Christopher Reeve = Superman. Yeah, that rendering looks like someone who doesn’t joke around. Caring for the plight of the downtrodden, but perfectly willing to pain you in the face if you are up to no good. Are you kidding me?! The first comment on my site from someone I don’t know personally and it’s the guy who did the stunning original artwork? I love the internet. What a great way to slide into the weekend. Thanks for the comment Roberto or Bob or whatever you prefer to be called.